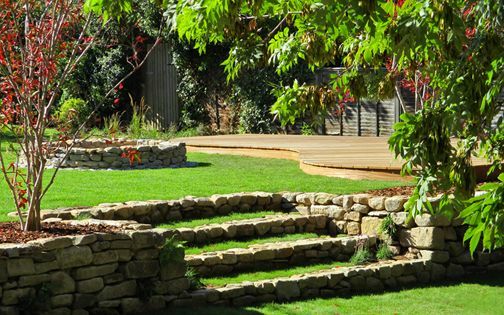 While we design and build many small London gardens, as well as large landscape gardens, we often specify buff sandstone in immense sizes to convey a natural hard landscape mindset. 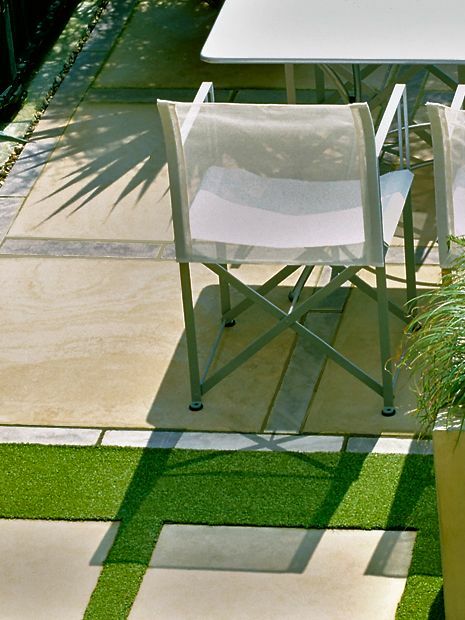 Sizeable flagstones enhance garden scale across varied locations and breadths, producing clear definition and warm tones. 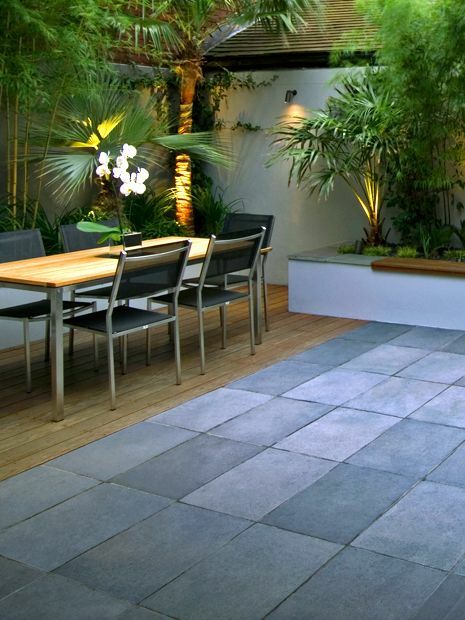 We also utilise concrete pavers, such as Blanc de Bierges, which closely resemble natural stone. Porcelain tiles present a broad spectrum of colours, finishes and thicknesses, and provide highly efficient surfaces, where we fit their slim profiles whenever stone is just too heavy. 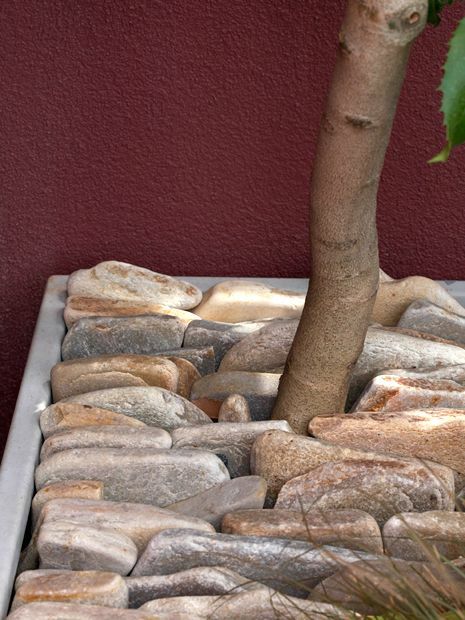 Yet, natural stone remains our most inspiring, central paving material as an authentic, tactile and diverse surface – the focus of all great hard landscaping! The gamut of porcelain tiles is undoubtedly vast, and the types available, particularly from Italy and Spain, are continually increasing. Often, we utilise tiles due to site limitations, where an 8mm profile forms a solution to a restricted sub-base. Tiles mimic natural stone well, and define a multitude of technical advantages, since grouting can be matched to the surface, ongoing maintenance is low, reversion of colour minimal and slip resistance predominantly excellent. 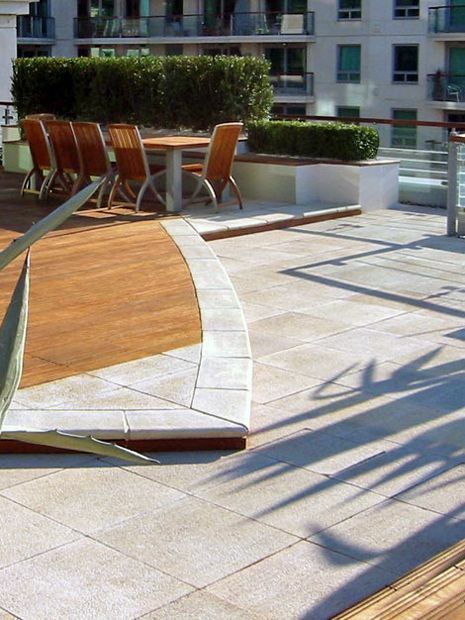 When designing penthouse gardens, where structural weight is occasionally limited, porcelain tiles are exceptionally practical by contributing a comprehensive array of sizes, natural finishes, consistent thickness calibration, reduced densities and minimised haulage. As scores of London homes feature tiled floors, we galvanise indoor-outdoor flow by matching frost-resistant tiles with their interior equivalents. European slate is largely imported from Spain, though many beautiful variations originate in Brazil, Portugal and South Africa. 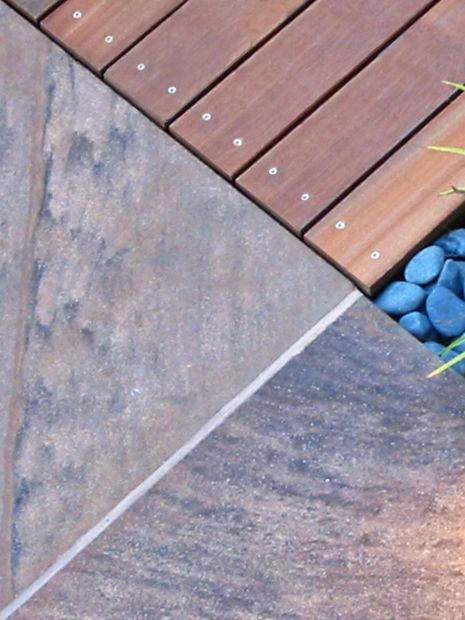 We specify slate for countertops, water features and coping, yet mainly as paving surfaces. A robust material, slate can be specified in narrow bands, optimal in areas where we require dynamic detail, such as pathways. Quarried in slim profiles, slate's solidity enables large slabs to be formed at mere 30mm height, and this valuable attribute sustains efficient transport, on-site storage space and labour management. This grainy, igneous construction stone, fashioned into a myriad of kitchen countertops, isn't as beautiful as sandstone, yet consistently handy. 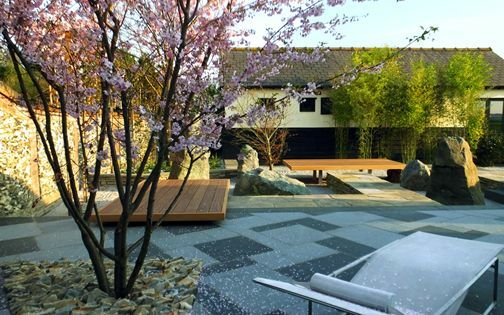 Granite in the West is often associated with corporate plazas, airport foyers and private driveways, yet in Japan, white, grey, pink and black granite stones are integrated homogeneously into spiritual compositions in temple, memorial, public, residential, traditional and contemporary rock gardens. 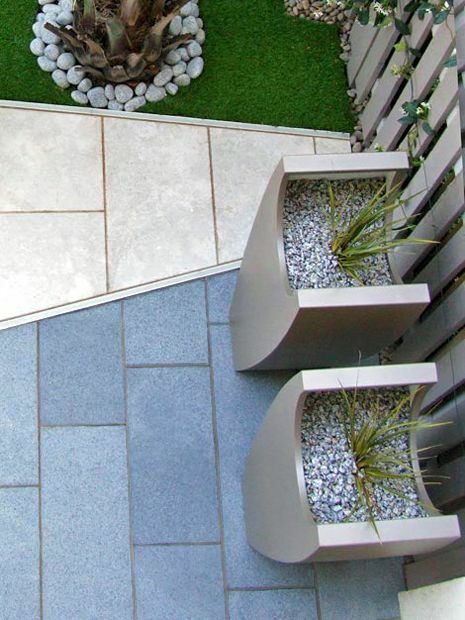 By utilising the material's resilience and multiple finishes, colours and textures, we create meaningful gardens and urban roof terraces which fulfil low maintenance requisites. 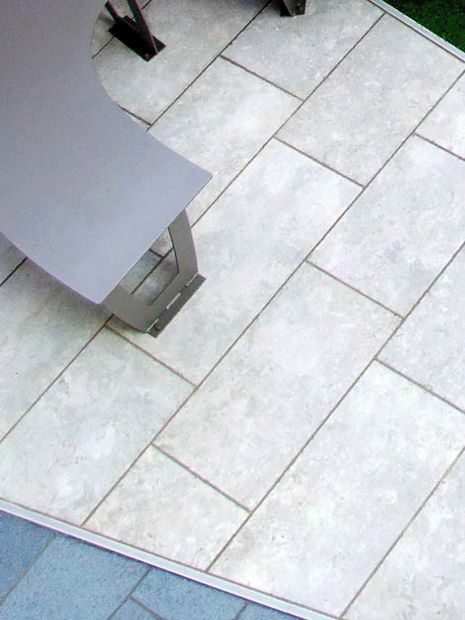 Blanc de Bierges is manufactured in Derby, East Midlands, and we utilise these warm versatile concrete pavers in gardens and London roof terraces. This pioneering modular system also provides one-off sizes, while slabs are engineered in a variety of distinct finishes. 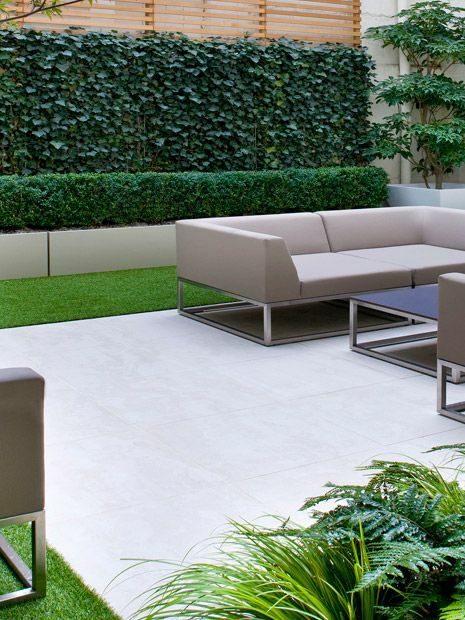 The tactile material sustains durable surface solutions, as well as planters and furniture, which appear extraordinarily natural and consistent in their dimensions, tones and textures. Concrete's permanence, strength and adaptability, increasingly mimicked in modern-day production of fibreglass, composite materials and tiles, facilitate vastly long-term constructions which relieve industrial impact on our environment. Various limestones aren't fully frost-resistant in Western Europe, while the material's brittleness and ongoing sealing requirements entail a challenging upkeep routine indeed. 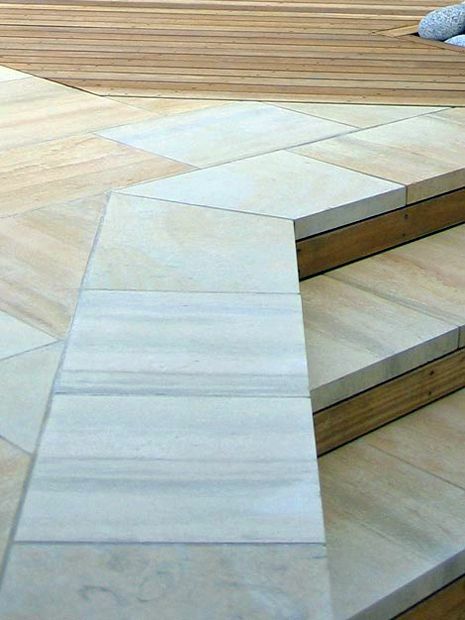 Yet, high-quality, cold-hardy limestones feature a clean buff sandstone characteristic with distinct veining prevalent in many granites – utilised effectively as a dynamic and tactile hard landscaping material. Vast size variations are typically quarried at slender profiles, handy when a sub-base is outjutting. Similarly to sandstone, this pale paving surface element is often tarnished in a high water table and below overhanging trees, where thorough sealant preparation is vital, augmented by regular, adequate maintenance which retains and enhances vivid tones. Red veining in sandstone forms an invigorating, integral feature, complementing materials such as hardwood, granite and concrete. In California and Central Australia, sandstones are extensively red, and display highly unusual geological facets. A few red sandstones are available in the UK, imported chiefly from India and China, though they're best matched wisely with intrinsic flora characteristics and daylight ambience. The red veining is intriguing, since it represents Earth's natural process, the stone's evolution and its provenance. Buff sandstone isn't as shimmering as porcelain or limestone, and displays fascinating, inherent fossil imprints, while complementing countless landscape design materials in diverse climates. 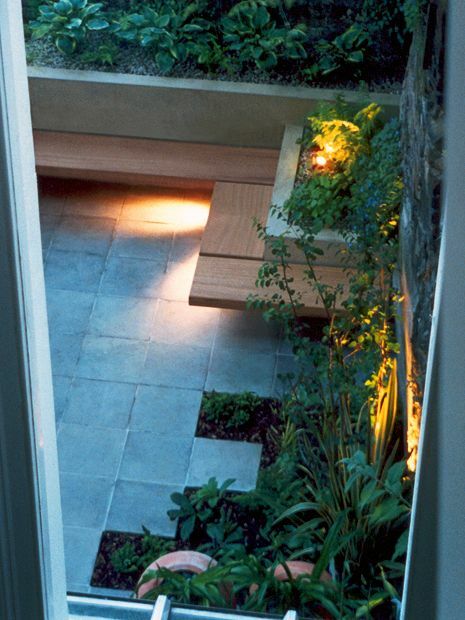 Foliage silhouettes generated onto the stone produce a dynamic interplay of contrasting shadows and light, while large-scale buff flagstones truly increase sense of space in small urban London gardens. There are numerous sources for this beautiful material in Yorkshire, China and India, although buff sandstone, as a soft sedimentary rock, requires attentive specification throughout various design & build methods. Certain grey sandstones appear monotonous at times; we prefer a smooth stone, slightly varied, combining it with vibrant textures. We produce subtle nuances utilising various finishes, such as flamed, bush-hammered, honed and sandblasted. 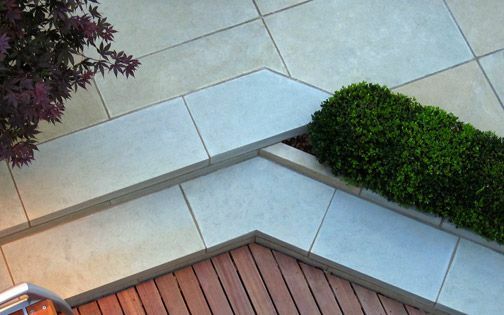 These captivating hard landscaping techniques provide tactile surfaces, useful in creating bespoke step treads, landings and refined detail design within a broad spectrum of well-constructed architectural gardens. We love the gracefulness of blue sandstone, and in London it blends seamlessly with natural light during daytime, appearing effortlessly elegant, as in many Northern Hemisphere gardens. James van Sweden and Wolfgang Oehme, the innovative American landscape architects, have blended blue stone abundantly into their remarkably expansive blueprints, which complements their romantic vision of natural prairie gardens organically. 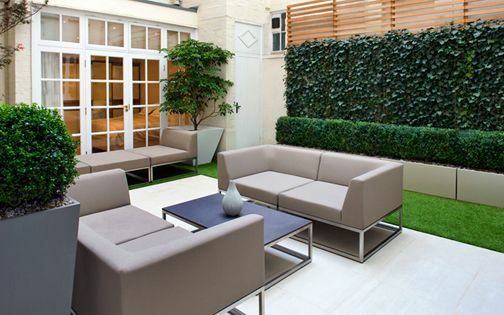 In this small contemporary Kensington garden, we sought naturalistic essence by infusing light bluestone serenity. 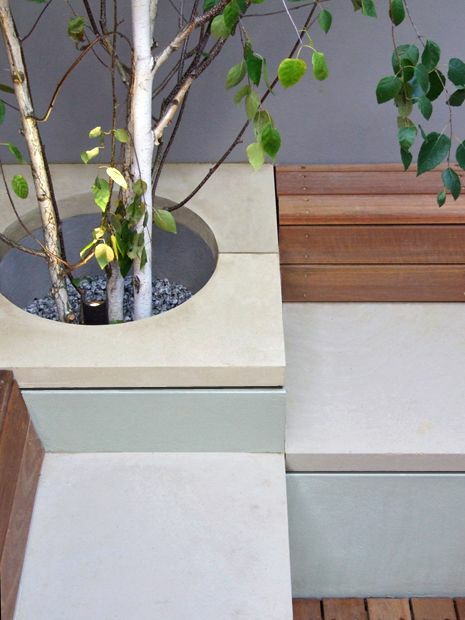 Fused within minimalist hard landscaping alongside a lush woodland, the smooth cerulean sandstone invigorates a densely shaded outdoor space – narrating a miniaturised landscape garden in London. 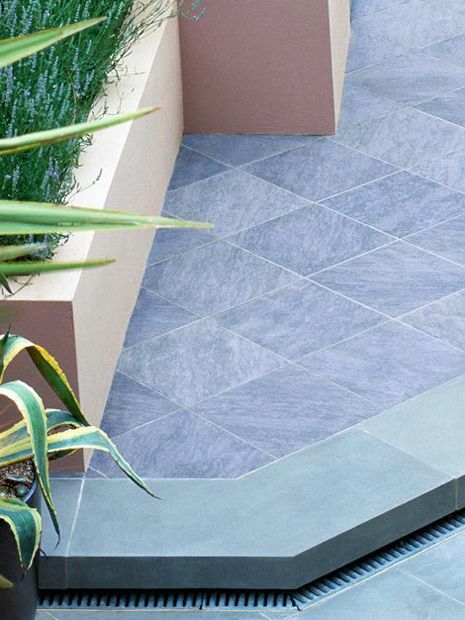 Lilac and purple sandstones are certainly unique; originating mainly in Derbyshire's Peak District, China and the US, these unusual stones are often applied in facade cladding, yet produce remarkable essence when utilised as paving within contemporary outdoor spaces. Effective detail design methodologies integrate bold lilac stone by contrasting it with a subtle palette of beige, buff, slate, taupe or off-white hues. Specifying oversized dimensions is outstandingly beneficial in small city gardens, where we increase pivotal sense of depth, and highlight sinuous natural patterns across individual broad flagstone outlines. Integrating natural stone into contemporary gardens fuses an ancient material within renewed outdoor settings, enhancing vital context. A stone's organic qualities are timeless, redefining a newly constructed garden with the history encrusted in its veins and fossilised essence. By utilising innovative design techniques, contrasting materials and energising foliage, hard landscaping forms a solid anchor for a gamut of details and textures. 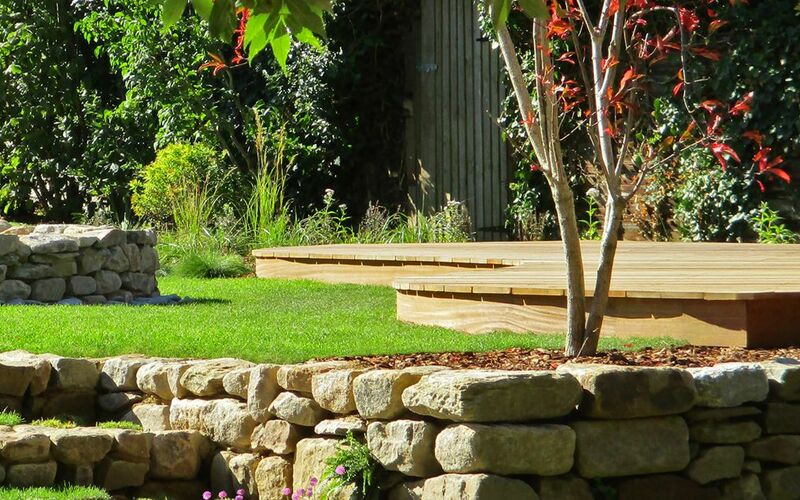 This unique matrix of landscape nuances we construct to articulate a cohesive garden design unfailingly generates bespoke elements in memorable outdoor spaces across a low upkeep, and not-so-hard platform for creative garden design professionals.